Let’s see what the advantages of working with mobile offers are. The number of users of tablets and smartphones is growing every day, which allows monetization of mobile device traffic. Currently, the share of mobile users in the world has surpassed that of desktop users, and advertising budgets are rapidly flowing to mobile. Mobile traffic is much easier to segment, target and measure: this allows publishers and advertisers to conduct advertising campaigns more effectively, and earn more. As mobile offers are usually offers to install some kind of application from App Store and Google Play official sources, the target action is to install applications on the user’s device. Your leads are automatically considered confirmed as soon as the user has completed installation. Data is entered into the system without delay, so you can receive the money earned in the next payment. But there is always something... To not pay for low-quality traffic, an advertiser puts a restriction on payments in the form of KPI achievements on the offer. are additional conditions for final confirmation of mobile offer aims. Traffic meets KPI ⇒ balance will remain on your account and be paid. If the KPI is not met, the publisher, unfortunately, has funds rolled back, despite the fact that commission had been previously confirmed. 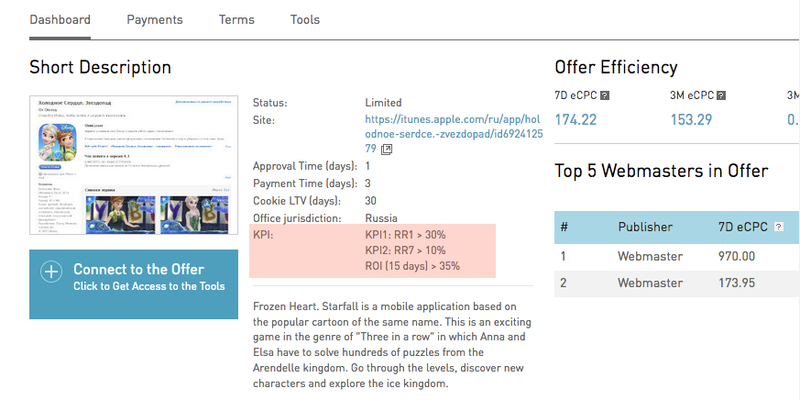 You can see conditions on KPI in Offers | the offer in question | Dashboard | KPI. Depending on the advertising campaign, the advertiser sets a mandatory achievement for the month of one of the following thresholds (KPI): KPI1, KPI2, ROI и CPS(max). Mostly, the mobile offer advertiser judges the quality of traffic by how many visitors returned to the application. The ratio of returned users to those who installed the application and have the same rate indicator the advertiser is interest in. RR1 > 15% – Number after letters RR is the number of days (N), if you count the hours, then we are interested in the period between 24h*(N-1) and 24h*N. In this case, the returns to the application on the first day (between 0 and 24 hours) shall be taken into account. To calculate the ratio of returns to installations, we need data on returns. Therefore, current figures will only be for reports “in the past”: for today, we have no data on returns, so it makes no sense to look at the report for today. To find the exact KPI1 = RR (Retention Rate) on day 1, we recommend that you look at the previous reports for every day, except today. Some advertisers set the conditions for returns to the application for 7 or 8 days. In this case, everything is the same as when calculating KPI1, except that we are interested in the number of users returning over 7 (or 8) days. RR5 > 3% – Number after letters RR is the number of days (N), if you count the hours, then we are interested in the period between 24h*(N-1) and 24h*N. In this case, the returns to the application on the first 5 days (between 96 and 120 hours) shall be taken into account. Same as KPI1, the data in statistics on returns only will be current in the past. To find the exact KPI2 = RR (Retention Rate) on day 7, we recommend you look at the previous reports for 7 days reports or more days in the past. The figure generally shows how advertising pays off. Some advertisers are interested in sales through the app more than returns. So they set the ROI, the ratio of received profit, to its costs. The advertiser’s profit is the difference between income and expenses [<sum of completed purchases> - <publisher commission>]. When calculating ROI, the “limitation period” of completed purchases is taken into account – for example, ROI5 means that the calculation takes into account only purchases made within 5 days after application installation. ROI7 > 50% – Number after letters ROI – the period in days. In this case, the number of purchases made within 7 days after the application is installed. To understand the ROI from an advertising campaign of a specific publisher, we look at how much the advertiser received in profit from the publishers and divide by the costs of the publisher (that is, the amount of commission to be to the publisher). Make sure that the report period was before the ROI period of the offer conditions. For example, if ROI5, then the current figures can be found only by looking for the report 5 days ago or before. It occurs when the advertiser pays for the installation, but he is interested in in-app purchases. Then he assigns the maximum value that he is willing to pay to get 1 purchase in his app (the fact is important, and the amount of purchase is irrelevant). For example, installation costs $2, but CPS = $30. This means that for every 15 (30/2) installs, there must be at least one purchase (more is possible, less is not). With this ratio, the advertiser will spend no more than $30 for every purchase that the publisher brings. CPS = 40 rubles is a constant, irrespective of the period. In statistics for any period, CPS on the offer will be calculated as follows: all total commission is divided into the number of purchases within the application. Remember that the KPI parameter always only refers to one offer and strongly depends on the periods in which you are viewing the report. In Statistics there is the Mobile apps skin, which is adapted for viewing KPIs on mobile offers.